The industrial development of Tanzania falls into two broad and overlapping stages, the development of consumer-related production with a large element of import substitution and the establishment of extractive and capital goods industries based largely on domestic reserves of raw materials. The first of these types of development was characteristic of the early years after Independence and particularly the years following the Arusha Declaration of January 1 1967, with its emphasis on self-reliance. Development for the consumer market will continue in response to population growth and rising expectations, but according to present plans will gradually yield in emphasis to the building up of basic and capital goods industries relying on the local mining and extraction of raw materials, particularly iron and steel. Industries of this kind have already been established on the basis of imported materials, notably the steel rolling mill at Tanga, the fertiliser factory also at Tanga and the oil refinery at Dar es Salaam. 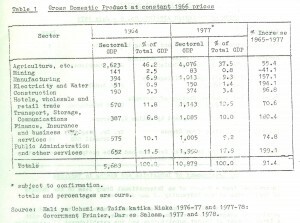 The growth of industrial activity during the years from 1964, the beginning of the First Five Year Plan, to 1977 can clearly be seen from the published figures of the Gross Domestic Product as set out in Table 1. The pattern of the monetary economy is there seen to have shifted markedly away from agriculture towards industry, water and electricity, building, transport and communications; in other words, towards the industrial sector of the economy. While the contribution of agriculture has risen by 55%, its relative contribution has fallen from 46% to 38%. Meantime, manufacturing industry has registered a growth of 157% and an advance in relative importance from 7% (3-4% at Independence in 1961) to over 9%. Still greater progress has been made by water and electricity (194%) and by transport and communications (180%), that is, by economic infrastructure. The recession in mining is referred to later in this chapter. 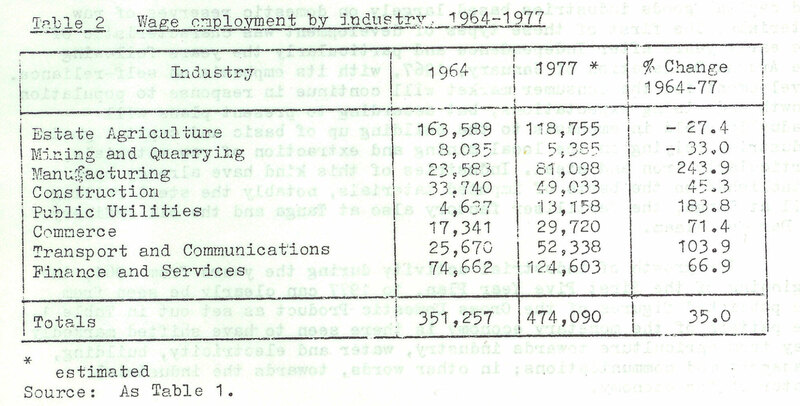 Another indicator of the shift towards industry, public utilities, communications, etc., is provided by the employment figures given in Table 2. 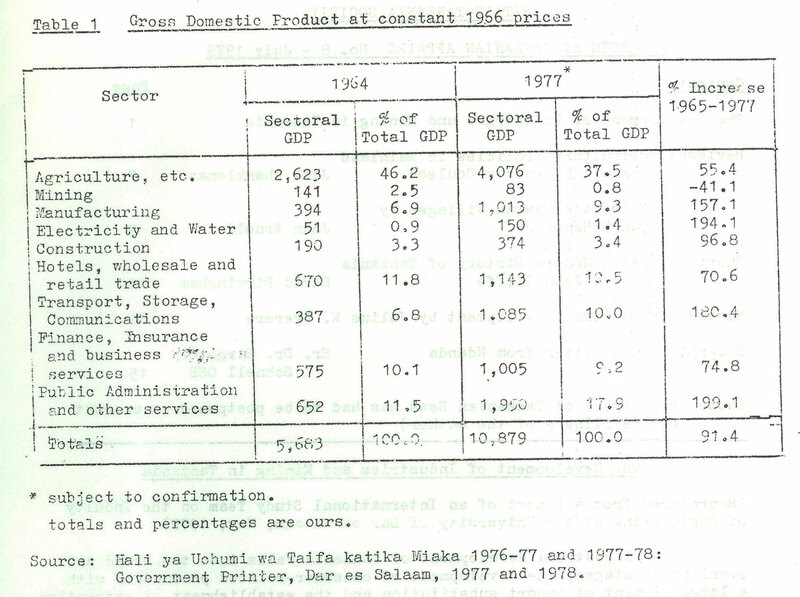 Source: Hali ya Uchumi wa Tajfa katika Miaka 1976-77 and 1977-78: Government Printer, Dar es Salaam, 1977 and 1978. More than most other African countries, Tanzania has from the first been notable for the thoroughness of its economic planning . At present such planning is carried cut within three time perspectives, namely, a 20 year plan setting out broad objectives and desired trends for the main features of the economy; a five year plan detailing the strategy for the ensuing five years; and an annual plan, which incorporates any necessary modifications to the five year strategy enforced by world circumstances, the accident of weather, planning delays and other influences…. (5) providing and extending facilities for research, advisory services and technological information for the benefit of industry. 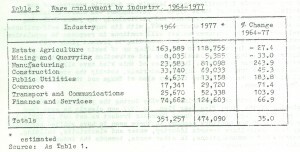 The intention of the long-term plan is to increase the contribution of manufacturing industry to the gross domestic product from nearly 10% in 1977 to around 20% by 1995; to increase the contribution of metal fabrication to industrial output from 10% to 30% and to reduce the contribution of consumer goods to the total from 65% to 40%. The general burden of the plan is, therefore, to change the balance of the economy decisively in favour of the extractive and capital goods industries, not at the expense of consumer goods, but in terms of relative growth. The establishment of industries for the manufacture of iron and steel is to have top priority in order to supply the needs of the metal fabrication and construction industries. At the same time the cement, glass products and wood products industries – all using local raw materials – will be increased to give added support to the construction industry, while factories producing chemicals, fertilisers, paper and printing machinery are to be developed. … Between 1980 and 1985 top priority will be given to the development of the following basic industries, viz., iron and ferrous products, cotton, leather and sisal, chemicals, various foodstuffs, paper and wood, and non-ferrous products (e.g., cement and building materials). Meanwhile, the domestic market will, it is hoped, have been developed sufficiently to justify these activities. A start with the iron and steel, chemicals and paper industries already appears in the Third Five Year Plan (1976-81). Crucial to the development of industry in Tanzania is the expansion of the electric power supply. In 1975 the total capacity of the power supply system was 150 megawatts, of which 86% was sold in the coastal area and around Arusha and Moshi. In 1976 the first Phese of the Kidatu hydroelectric power scheme on the Great Ruaha River came into operation with a further 100 megawatts, a system that has now been connected by land line to Dar es Salaam. Phase 2 of the Kidatu scheme will shortly be completed, with a further 100 megawatts. Meantime, considerable preparatory work has been carried out in Conjunction with NORAD (Norway) on the Stieglers Gorge project on the Rufiji River. (3) Reports have been submitted, not only on the construct1nn of the dam, but also on the use of power from Stieglers Gorge for the manufacture of iron and steel from the Liganga deposits of iron ore and the establishment of power-using industries based an local raw materials. Tha Stieglers Gorge project is therefore more than a hydroelectric power scheme, it is a plan for an industrial complex of considerable potential size and importance. The dimensions of this undertaking may be judged from the expectation of a power output of 600 megawatts, four times the total output in the whole of Tanzania in 1975. Further potential capacity lies in the Kiwira River scheme in Mbeya Region, with a maximum possibility of 233 megawatts, of which 14 megawatts are expected to be produced during the Third Five Year Plan; and in the Rusumo scheme, now under investigation, with a potential of 90 megawatts. A start will also be made during the Third Plan with a coal-fired thermal station based on local mines in view of the rising cost of oil. As already indicated, long-term planning relies on the development of local resources of raw materials, particularly iron and coal. It remains, therefore, to describe those resources and the prospects of their gainful exploitation. At Independence diamond mining was much the most extensive and lucrative form of exploitation of Tanzania’s natural resources, with gold following second in importance, yet for many years before that other minerals were known to exist in commercially significant quantities. Since virtually the entire mineral output was exported, it formed a valuable source of foreign exchange, but did virtually nothing to promote mineral-based industries within Tanzania. During the First Five Year Plan (1964-69), small quantities of coal, tin, mica, magnesite, tungsten, lime, salt, gemstones, glass-sand, kaolin and gypsum were produced; gypsum and lime were mined largely for internal consumption and salt was exported after meeting the domestic demand. Diamonds and gold, however, accounted for about 90% of production. In 1966, the Geita and Kiabakari gold mines closed and in 1970 the Buhemba mine. Thereafter production remained small, but plans are afoot to open further mines during the Third Five Year Plan period at Lupo in Chunya District, in Geita District and elsewhere, which are expected to achieve an appreciable output. Diamonds have for long been the most valuable mineral in Tanzania. In 1968, diamonds to the value of 164 million shillings were mined and exported. But the mines were becoming exhausted and in 1968 the remaining life expectancy was only ten years. In the event, however, it has proved worthwhile to continue mining, despite falling output, in view of rising world prices. While, however, the continuing diamond output was a useful asset in world markets, attention has increasingly turned to the exploitation of the country’s iron and coal resources and the importance of these minerals as a foundation for local industry. Although coal has long been mined at Ilima colliery on a very small scale for a local market, there are known to be extensive reserves of bituminous coal at Songwe/Kiwira, in which Ilima is situated at Mchuchuma/Yateweka. Chinese experts are studying the possibility of using coal from the Songwe/Kiwira reserves for the smelting of iron from Chunya; in addition its use for coal-burning thermal generators, the production of tar for road making and the production of a simple ammonia fertiliser have been considered. The use of the Mchuchuma/Kateweka reserves for smelting the Liganga titaniferous ores has presented difficulties and is still under investigation. Exploration has shown that iron ore deposits in Chunya District are extensive and capable of producing 250,000 tonnes of iron per annum. Reports have also revealed the presence of extensive ore deposits at Liganga in Njombe District with an annual potential of 500,000 tonnes. The Liganga ores, which have a 49% ferrous content, contain 13% of titanium dioxide and some associated vanadium. A West German team of experts is making a technical and economic study of the possibility of separating the vanadium and titanium. Meanwhile, a feasibility study by NORAD (Norwegian Government) of the use of power from the proposed Stieglers Gorge hydroelectric scheme for the manufacture of iron and steel from the Liganga deposits has been completed. The prospect for mining operations both of coal and of iron ore depend not only on the completion of the technical and economic studies now proceeding, but also on the construction of the necessary infrastructure, notably road and railway links, the necessary outlets for the products in local industries and abroad. This is a complex operation and the ramifications of it suggest that it may yet be some years before large scale mining operations can begin. Owing to the technical problems still to be surmounted and the work on associated industries and services still to be put in hand, it is too soon to put a firm date on the onset of extensive mining operations. Nevertheless; the studies already made and the information gained suggest that the exploitation of Tanzania’s iron ore reserves most probably will begin within the coming decade. Although the mining of Tanzania’s iron ore reserves is dimensionally and economically much the most significant development to be expected with reasonable certainty in the near future, considerable effort has also been expended on the investigation and development of other mineral resources. A search for exploitable oil reserves in the coastal sedimentary belt, started during the Second Five Year Plan, is continuing in the Southern Mainland, the Ruvu valley, south-east of Zanzibar and offshore. In the course of this search, natural gas was found at Songo Songo in Kilwa District and studies are now proceeding on the feasibility of its use in the manufacture of chemicals, especially ammonia. Meantime, the steep rise in price of phosphates imported from the Middle East for the fertiliser factory at Tanga has precipitated research into the possibility of using phosphates mined at Minjingu, of which there is said to be a 10-20 year supply. Studies are also being made of the direct use of this mineral as a fertiliser. This project has, however, encountered financial problems. Salt is a universal requirement for domestic use and the State Mining Corporation (STAMICC) has been preparing for the mining of salt to help to meet this demand and for export. Meantime, studies of the mining of gypsum are proceeding at Mandawa in Kilwa District to supplement the gypsum mined at Mkomazi in North-East Tanzania as a source of supply for the cement factory at Wazo Hill, near Dar es Salaam. At Lake Natron there are considerable deposits of soda ash and studies have been made of the refining and extraction of potassium and sodium chloride and of the technical, economic and transport problems involved. The Third Five Year Plan includes plans for mining operations at Lake Natron on a small scale. Reserves of magnesite at Chambogo in the Pangani Valley are being investigated with the help of West German support. Other minerals under investigation are tin and tungsten in te Karagwe area, including the possibility of reopening the Kyerwa mine closed in 1971; asbestos, hitherto recovered in small quantities at Ikorongo in Serengeti District and elsewhere; copper, cobalt and nickel in the Piti River south of Tabora; and a number of rare earths and natural abrasives. Kaolin is produced in the Pugu Hills near Dar es Salaam and used for ceramics and potentially for paper making, with glass sand as a by-product. Finally, there has for some years been a successful industry in gemstones including the attractive green ‘Tanzanite’ which in 1976 contributed a useful 3 million shillings to the country’s foreign exchange reserves. This account of the prospects for the economy would be incomplete without passing reference to the growth of small industries under the general superintendence of the Small Industries Development Organisation (SIDO). The long-term aim of this body is to promote small industries in the form of production cooperatives, particular]y in the villages, thereby not only advancing rural prosperity, but also decentralising the production of such consumer goods, components, etc., as can be produced economically on this basis. Small industries will be labour intensive and capital extensive and will therefore in many cases call for adaptation of methods of production and a resort to simple productive procedures. Such adaptations will offer a considerable challenge to engineers, involving not simply a reversion to historic semi-manual methods of production, but a modification of modern technology with the greatest economy in capital investment and a maximum use of human and other local resources. The importance attached to this development by the Government can be seen from the allocation of T shs. 117,241,000 to SIDO projects in the single year 1978-79. (1) Sources of statistics: Bali ya Uchumi wa Taifa katika Mwaka 1977-78 ; Bank of Tanzania Economic Bulletin, Vol.IX No.3, Dec. 1977 ; Taarifa ya Hali ya Uchukuzi na Mawasiliano Nchini; Government Printer, Dar es Salaam. Mpango wa Tatu wa Maendeleo ya Miaka Mitano ya Kiuchumi na Jamii, 1 Julai 1976-30 Juni 1981 : Sehemu ya Kwanza- Shabaha na Maelekezo: Government Printer, Dar es Salaam. (2) Mpango wa Maendeleo wa Mwaka 1978-79: Government Printer, Dares es Salaam. It is, unhappily, more than probable that substantial parts of this programme have fallen victim to the Uganda War and will have to be postponed. (3) Details are taken from Norges Samarbeid med Utviklingslandene, 1977: NORAD, Oslo, 1978. (4) The facts in this section on mining operations are taken from the following sources: Tanzania Second Five Year Plan for Economic and Social Development, Vol.1: General Analysis, Chap. 5; Mpango wa Tatu wa Maendeleo ya Kiuchumi na Jamii, Kitabu cha Kwanza, Shabaha na Maelekezo, na Kitabu cha Pili, Miradi: both Government Printer, Dar es Salaam. Mpango wa Maendeleo wa Mwaka 1976-77, 1977-78 and 1978-79; Government Printer, Dar es Salaam, 1976, 1977 and 1978 respectively. Hali ya Uchumi ya Taifa katika Mwaka 1974-75, 1975-76, 1976-77 and 1977-78: Government Printer, Dar es Salaam, 1975, 1976, 1977 and 1978 respectively. Under the economic, political and social systems at present operating, the world’s people are divided into two groups – those with access to its resources and those without access. Those with access to existing resources – the rich – can afford to invest heavily in the production of greater wealth, so they get richer. The poor have very little to invest; their productivity consequently remains low and they remain poor. Worse still, the market laws of supply and demand mean that the wealth of the few diverts the world’s resources – including the labour of others – from meeting the real but ineffective demand of the poor into satisfying the luxury desires of the rich. Land and labour are used to cultivate grapes instead of grain; palaces are built instead of houses for the workers and peasants. The automatic market tendency to favour the rich is aggravated by the fact that political power also flows naturally to the ‘haves’ of the world – the educated and those persons or societies which have inherited public or private capital. The result is that publicly produced wealth also benefits the wealthy more than the poor, accrues to the towns rather than to the rural areas and serves the educated rather than those without academic opportunity or ability. Until now we have in general been trying to tackle the problem of poverty – including rural poverty – by directing resources into the existing system and hoping that it will ‘trickle down’ to the poor. Some of it does. But the major benefit of the new investment stays where it began – with the man who already has and in proportion to the wealth which he already has. The poor benefit – or sometimes suffer- from the side effects; or they receive the crumbs left over. The lesson to be drawn is surely that fighting poverty is not just a question of production techniques and capital investment. It is a highly political topic. It involves matters relating to the existing wealth distribution and the present location of power within nations and between nations. For the root of world poverty, as well as the mass of it, lies in the rural areas. Urban poverty is more obvious – the slums and degradation of some towns in the developing countries force themselves upon the notice of the richest citizen and upon the most casual visitor from other states. But the bulk of the slum inhabitants and the beggars on our streets have migrated to towns because they are pushed out of the rural areas by landlessness, joblessness and hopelessness . It is therefore in the rural areas that we can most effectively tackle the long-term problems of urban poverty, as well as dealing with the mass misery which now exists unseen – hut not unfelt by its sufferers. Trying to deal with mass poverty by improving conditions and providing work in the towns simply attracts more and more people from the depressed rural areas. An effective attack on world poverty can only be made by going direct to the rural areas and dealing with the problems there. The objective is and must be the provision of food, clothing, shelter, education, and health services, for everyone, under conditions which provide for universal human dignity. That objective can only be achieved if certain basic facts are recognised and acted on. First among these is that those who own land will use it for their own benefit. If the land in a state is owned by a small number of people, these can be relied upon to maximise their own private income from that land by using for whatever crop will bring most profit to themselves. If the land is owned by the peasants, either individually or collectively, it will be used to meet their needs. Actions which transfer land to the people are an essential first step in the fight against poverty. Even if effective land reform is carried out, that is not enough. The poor who have gained land under it – again whether privately or cooperatively – have to have access to credit, to improved seeds and tools, and to new knowledge, if the transfer of power over the land’s resources is to be permanent and to lay the basis for future development. But ‘Land to the Peop1e’ is not a solution on its own. If poverty is to be abolished in the rural areas, farming activities must be efficient. Rural industries must be established to process the farmers’ crops and provide many of their domestic and agricultural goods. Forestry and animal husbandry must use land not suitable for arable farming. Water control and land conservation measures must be built to increase the productivity of the land at the same time as they provide clean water and possibly power. Schools, dispensaries, sports facilities, and so on, need to be established. This kind of diversification of the rural economy is an essential part of the struggle f0r human development and human dignity. At least in the initin1 phases of our development our agriculture and our rural service industries need to be labour intensive rather than capital intensive. But to say that the rural areas must produce a surplus to finance diversification is to beg the question. Rural areas do produce a surplus now. The trouble is that it is extracted and used to finance luxurious consumption pattern of the rich and the kind of development in urban areas which will support the present economic structures. The surpluses are extracted by the comparative pricing of primary products and manufactured goods. It is done also by the combination of regressive taxation and the allocation of Government expenditure to services needed by town dwellers rather than those needed by the people in the villages. Rural development and the diversification of the rural economy which it involves will not take place without fundamental changes in the present approach to development and to government activities. This implies giving priority to universal primary and technical education in preference to advanced studies in the humanities, or indeed to much in the way of post-graduate professional studies. It also implies that rural dispensaries and health centres will have to be given preference over sophisticated hospital services for the few. Although internationally we are still at the stage of regarding a transfer of resources from the rich to the poor as being a matter for the voluntary decision of the rich, there is no excuse for such an attitude within nations. Giving land to the people and acting to ensure that rural surpluses are retained in the rural areas is essential; but it is only the first step. It has to be combined with deliberate policies which transfer resources from these wealth producing sectors to the financing of social and productive capital in the rural areas. This can be done either by government control and pricing policies, or by the taxation structure, or by a judicious mixture of the two. It is surely quite obvious that as rural development has all these implications it will not occur unless governments are absolutely committed to attacking poverty at its roots in the rural areas. But that is not the whole answer, Governments by themselves cannot achieve rural development. They can only facilitate it and make it possible. For rural development is people’s development of themselves, their lives end environment. If the people are to be able to develop they must have power. They must be able to control their own activities within the framework of their village communities. The people must participate not just in the physical labour involved in economic development, but also in the planning of it and in the determination of priorities. At present, the best intentioned governments – my own included – too easily move from a conviction of the need for rural development into acting as if people had no ideas of their own. This is quite wrong. Both political and economic power has to be held by the people within the village, in the Region and in the nation, if development is to be in the people’s interests. It is through cooperation that each of us develops his own potential and receives personal identity. Within our developing countries there is a tendency to think that if you have made a budgetary allocation for something called ‘rural development’, then the rest or government policies and expenditure patterns can go on as before. Such attitudes defeat any hope of rural development, or of implementing a ‘basic needs approach’. Rural development, for example, requires greater use of fertilisers, with the consequential need for a fertiliser plant, or a phosphate mine, or both. It needs a factory to produce animal-drawn ploughs, harrows, seeders and another producing tractors and bulldozers. It needs electrical power, both for decent living in the rural areas and for village industries. A rural development strategy thus requires a whole industrial and communications development policy, which is geared to the needs of the rural areas and the masses who live in them. Every aspect of government and public activity, in other words, has to be angled towards promoting mass welfare in the rural areas, while yet enabling the urban areas to service effectively the rural areas from which their sustenance comes and which are their justification for existing. Everything which I have said in relation to the implications of a strategy of rural development within nations can also be applied to international economic and political relationships. Under the present world economic order the rich and industrialised areas – regardless of whether these are capitalist or socialist – automatically, as well as by the exercise of naked power, extract from the poor and rural areas even that little which they have. It is done through the pricing mechanisms of primary products relative to manufactured goods, by the virtual monopoly of international transportation facilities, by the control of world currency and credit which is exercised by the rich nations – and by a hundred other so-called market forces. The fundamental imbalance between the world’s rural and urban nations – between the industrial and the primary producer areas – is not yet universally recognised as the root causes of world economic problems and world poverty. It is clear that a strategy for rural development has two aspects. One is internal within the nations of the Third World. The other, equally important, is external to any single nation; it involves the whole world. The problem of poverty cannot be effectively tackled unless there is action on both fronts simultaneously. Coulson’s article gives a thorough survey of the vicissitudes in agricultural production policies in the thirty year period 1946-1976. The article also contains some discussion, although with less comprehensive coverage, of agricultural marketing structures over the same period. (iii) the assumption that in agriculture the initiation and implementation of policy had to be carried out by government officers, because the African population was ignorant and backward. Coulson describes various forms which agricultural policies assumed against the background of these assumptions. His description is particularly clear for the colonial period, rather less so for the fifteen years after Independence. It is useful to list the main features of successive policies. (ii) the groundnut scheme- intended to produce supplies of oils for Britain by establishing modern, large scale, but state owned estates. (iii) the ‘Land Development and Soil Conservation Scheme’. This was intended to introduce ‘modern’ methods to African peasant farmers by dint of by-laws and legal sanctions enforcing specific, and very detailed, farming methods. None of these schemes were long-lived and all failed. The settlement of white farmers met successful resistance by African farmers to the appropriation of land; the groundnut scheme was technically ill-founded; whilst African farmers met the strict control of their farming practices with passive resistance. As Coulson points out, the failures of the latter two policies were not only organisational and political, but also technical. Grounded in a faith in western methods, the techniques invoked were generally wholly inappropriate to Tanzanian, or peasant farmer, conditions. From the mid 1950’s up to the late 1960’s there was a shift in attention towards those African farmers who individually or collectively appeared likely to develop modern, westernised agriculture. In the last years of colonial government and early years of independence the ‘focal point’ approach channelled advice, equipment and credit towards the more successful and wealthier individual African farmers. The nebulous belief behind this approach was that others would copy the methods of the successful. In fact this approach exacerbated the inequalities in land holding and access to other resources, and appeared likely to lead to a polarisation of the rural population into capitalist farmers and landless wage labourers. Opposition to policies which thus encouraged inequality caused a shift within the same ‘focal point’ approach towards groups of farmers rather than individuals in the post-Independence ‘settlement schemes’. These aimed to re-settle groups of farmers on new land, make available the tools of modern farming and await a transformation in agriculture, which would again trigger imitation by other groups. Coulson argues that during this period agricultural production did increase. He ascribes this to the emergence of some large scale African farmers and to the expansion of the area of individual peasant farms. He notes the agricultural failure of the settlement schemes; and also argues that the intervention of agricultural ‘experts’ had little to do with the growth of production. As in the previous period, many of the approaches canvassed by the extension service were inappropriate or incorrect, whilst in addition the size of the service meant that few farmers had much direct contact with extension advice in any case. Since 1967 agricultural policy has again taken a mass, rather than a selective approach, first with the encouragement of ujamaa villages then with the villagisation programme. In both the voluntary formation of ujamaa villages and the wider and compulsory villagisation scheme, emphasis has been placed on the resettlement of population into villages rather than the scattered settlements of individual households and farms, which had been common in many areas. In discussing this latter phase of ujamaa and villagisation, Coulson deals more with the political and administrative aspects of the policies than with the agricultural. Had he looked in more detail at the production policies which villages are encouraged to follow, he would have seen an extension of several aspects of plans developed, and abandoned earlier. The Ministry of Agriculture, together with aid bodies – notably the World Bank – have sought to expand cash crop production by peasant farmers by encouraging the cultivation of at least one cash crop in each area of the country. This encouragement has ranged from the minimum acreage by-laws mentioned by Coulson to credit and input packages which seek to schedule and direct production of crops which have been chosen for the area by planners and administrators. Coulson states in a resume of the article that “a general conclusion is that those who controlled the State consistently misunderstood fundamental aspects of peasant agriculture and over-estimated what the use 0f State power could achieve in rural development”. This he certainly shows in the case of policies up to the latest phase. However, he has not been able to show conclusively that in the case of villagisation the State has over-estimated what it ~an achieve, since he has come to no clear conclusion about the State’s goals in villagisation; nor, as he makes clear, are the results of villagisation fully evident in any respect yet, be it political, agricultural, or social. More generally, Coulson appears to hold doubts on the viability of any government intervention in agriculture. This is suggested by brief references to the success, in ecological terms, of pre-colonial agricultural systems and the repeated reference to the localised successes of the ‘focal point’ approach, where individuals were motivated by ‘the possibility of getting rich’. Since this individualistic approach cannot be compatible with any socialist system, it would be interesting to know whether Coulson perceives any forms of government intervention in agriculture compatible with both socialist aims and success. A quick answer to this might take the form of the need for involvement of farmers in formulating plans and policies. Whilst this broad statement is unexceptionable, there are enormous problems in conceiving, let alone implementing, structures that would involve the mass of farmers in a real, not a nominal, way; and in reconciling the contradiction between an economy in which commerce and industry are dominated by the State and agricultural production by small-scale peasant producers. In the post-Arusha Declaration period, this is maybe the central problem of agricultural policy in Tanzania. Tanzania’s Ujamaa Villages: the implementation of a rural development strategy by Dean E. McHenry Jr.: Institute of International Studies, University of California, Berkeley. Discussion of Tanzania’s rural development policies is an ideological battle ground where the contenders whether seeking to defend Nyerere’s policies or attack them from the left or the right are too often content to collect and present only the evidence that supports their case. The size and diversity of the country make genuine research difficult and expensive and there is a tendency for articles to quote the same references, comments and conclusions. It is not surprising that views on ujamaa villages and villagisation have become polarised and stereotyped. There has been a deplorable absence of hard facts and unbiased analysis. In marked contrast to most published work, Dean McHenry has provided an invaluable dispassionate study of the context within which the ujamaa village policy was formulated, the methods by which its implementation was attempted, the extent to which the efforts have been successful and the lessons for Tanzania and countries with similar problems. McHenry undertook most of his research while teaching at Dar es Salaam University and he clearly has a profound basic sympathy for Tanzania and Nyerere’s policies and a wide understanding of the issues. He makes extensive use of published information and speeches, but he has also done his own researches at village level. The study begins with the necessary reminder that neither the problems identified in the Arusha Declaration, nor the solutions proposed, were new. In ‘Ujamaa – the Basis of African Socialism’ Nyerere linked the cooperative aspects of traditional African society with his ideas for reviving rural communities. To emphasise the new approach represented by Arusha, no reference was made to the efforts made during the colonial period to resettle and concentrate peasants first as anti-sleeping sickness measures and later to open up new ground and crops. Emphasising new approaches made political sense, but colonial settlement schemes are part of Tanzania’s history remembered by the peasants, even if the lessons had to be relearnt (largely at the peasants’ expense) by a new generation of politicians and administrators. Colonial officials had also to face the practical and moral problems of implementing policies which were not understood, or resisted by those who were supposed to benefit. 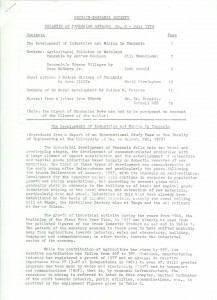 If the politicians and administrators of independent Tanzania had had the time and inclination to study the recent history of their country, they would have been better prepared to face the problems posed by the vastly more ambitious policies for the creation of ujamaa villages and then total villagisation. There had been little change in the social and economic conditions nor in the administrative resources available. The new factors were the enhanced powers of the Government and the existence of a national political party and great reliance was placed on the ability of the Party to inspire and mobilise popular support for the new policies. In a detailed examination of the structure of the Party, its membership and operation, McHenry identifies some of weaknesses as an instrument for mass political education. Similarly, he demonstrates that the Government machine was no more effective than its colonial predecessor in establishing genuine popular involvement in decision making. The ujamaa villages were expected to make possible the provision of basic services to the rural population, increase agricultural production by the introduction of improved farming methods and move society decisively in a socialist direction. 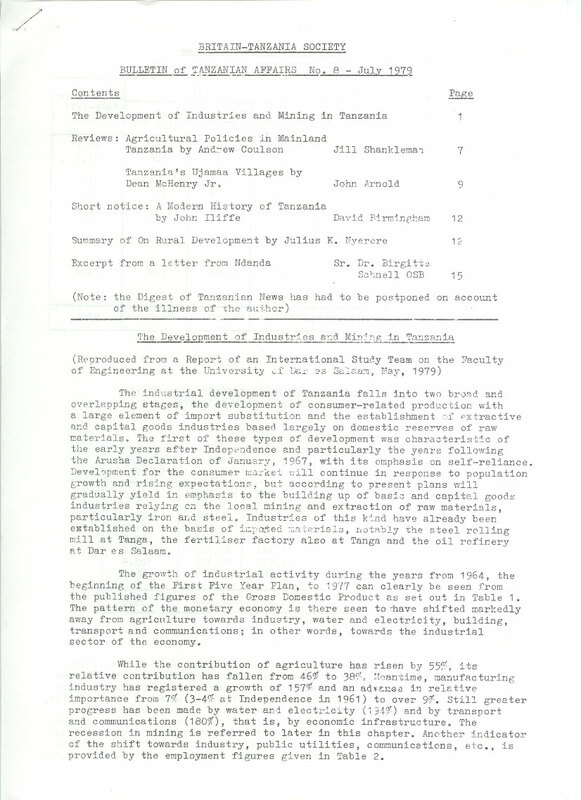 The political initiative for this new approa.ch to development in the post-Arusha period was born of frustration at the failure of officials, experts and extension workers to produce any perceptible progress towards rural transformation, stimulate stagnant agricultural production, or deal with the disarray of the cooperatives. The objective of moving peasants into villages was achieved, but it was not done by political inspiration, nor the complex of material and status incentives, which the Government machine could offer. The mass movement of the reluctant was eventually achieved by force or the threat of force and McHenry plots the shift in policy, resulting from the conflict between ideology and the practical problems of its implementation, by which first the objective of communal work was abandoned and then the way opened for force to be employed. Although the Government never specifically authorised force and denounced cases where it was used in excess, there is no doubt that local politicians and administrators were under pressure to produce results and no guidance was given on the alternative methods which were permissible. McHenry rejects the official defence that force was never policy and that its use was rare; the stories of the occasions when it was used spread rapidly and provided a powerful incentive to those who were resisting other arguments. The variety of methods used to induce people to move into villages inevitably resulted in a wide range of motivations and confusion of ideas as to what ujamaa entailed. McHenry’s personal research involved collecting information from ujamaa villages in four Regions on how much and what kind of work was being done communally and who participated. The conclusions indicate that a small proportion of food was being produced communally possibly because there was too much risk in leaving such a necessity to a new and untried method. In non-agricultural activities communal work was much more common possibly because it was practical and permissible to enforce participation. The unresolved question remains why did Tanzania’s leadership expend so much effort on achieving villagisation? They must have known that the provision of the promised basic services could not possibly keep pace with the creation of new villages, thus inevitably producing disillusionment. Implementing the policy strained the Party’s principles, but produced meagre material gains; indeed agricultural output may well have fallen. Was it simply a method of ensuring greater Party and Government control over the peasants, or are there long term gains still to come? As well as presenting a coherent and carefully documented account of Tanzania’s rural development policies, McHenry’s book is an invaluable work of reference containing more than 60 tables of informaticn. Anyone engaged in teaching the politics or economics of Tanzania should ensure that their students do not see this book first unless they are already certain that they are quite clear on the composition of the National Conference, National Executive Committee and Central Committee, or are quite familiar with ‘number of inhabitants per agricultural officer by Regions and years’. One word of warning. Skip the first chapter, which contains a valiant attempt to define ‘development’, ‘policy’ and ‘implementation’, but becomes hopelessly bogged down in statements such as: ‘Other ends which are sometimes used to define this non-choice orientated conceptualisation of development include …’. Presumably this is for the benefit of his sponsors, because once McHenry actually begins writing about Tanzania he presents the complexity of facts and opinions with splendid clarity. A Modern History of Tanganyika by John Iliffe: Cambridge University Press, African Studies Series No. 25, 1979, Paperback f7-95. 616 pp. All friends of Tanzania will welcome the appearance of John Iliffe’s great work: ‘A Modern History of Tanganyika’. This book was researched during the 1960’s when John Iliffe taught at the University of Dar es Salaam and was written in the 1970’s while he was teaching at the University of Cambridge. It is a fundamental contribution not only to the history of Tanganyika but also to the overall understanding of the history of Africa. It will undoubtedly go down as one of the great publications of this decade. The first quarter of the book deals with the nineteenth century and with the crisis of the colonial advent and the coincidental ecological catastrophe of the early twentieth century. The remaining 450 pages are concerned with the twentieth century up till 1961. The Bulletin hopes to carry a full review in its next number. Meanwhile at under £8 for the paper back this must surely be one of the best buys on any member’s shopping list. Never in my life have I seen so much rain as in the last few months. In many places lakes have appeared. Where there were streams, rivers now gush forth; where there was dry land, streams flow everywhere. On Easter Monday in Ndanda 5.4 inches of rain fell between lunch and supper in three separate downpours. The entire pathway from our house to the hospital was a river, through which one had to wade. And on that evening there was an accident. The ground in this area is sand and upon it lies our new tarmac road (*) At one point not far from Ndanda the sand beneath this new highway was washed away. It all began in Holy Week. Each day, a bit more of the road foundations was washed away by the deluge, while above them the tarmac held firm, so that nothing was visible from above, only from the sides. On this account a barrier was set up. But on the Monday the rain was so severe that for some twenty yards three quarters of the width of the road were undermined. Somebody chose that very moment to remove the barrier and got safely across in his car, but he was followed by a truck carrying twenty people, which was less fortunate. The tarmac surface caved in and the truck fell sideways into a cavity some fifteen feet deep. It was difficult in the rain and darkness to extract the injured from the hole and many of the injuries were severe. All the casualties were brought to the hospital and all three doctors and the entire supporting staff were hard at it for three hours. All survived except two unborn children, who died. Meantime, a diversion was constructed, but it led over a stream by a small bridge, which was too small and weak for heavy traffic. A thirty ton truck with ten wheels actually attempted it. As the bridge is so narrow, the railings and posts along one side have already been smashed. Now another way round has been built in another spot over pipes jammed together with sand, but within an hour the rain had destroyed everything. Now the gap has been filled in again. But the rain is back once more. Not far away, a mile and a half from here, there have been more than 63 inches of rain since November, 1978. Here in Ndanda the figure is a little lower. (*) This is the new partly finished highway from Mtwara to Songea, an important trunk road for opening up the south of the country. The rain washed away crops and crippled communications throughout the south. In our next number, we hope to bring a review by Professor T.O. Ranger of Towards Socialism in Tanzania: edited by Bismarck U. Mwansasu and Cranford Pratt (Tanzania Publishing House, Dar es Salaam, 1979). This contains an important scholarly analysis written from a number of points of view. Readers will remember The Critical Phase in Tanzania 1945-1968 by Cranford Pratt, which we reviewed in our Bul1etin No. 2 in July, 1976. We also hope to review Hali ya Uchumi wa Taifa katika Mwaka 1978-79 (Government Printer, Dar es Salaam, 1979) as we have done previously in successive years. The editor would also like to hear from any members who are able to write about Tanzania’s agricultural policy and practice out of first-hand experience. Additional copies of the Bulletin may be obtained from the Hon. Secretary at 50p. post free. Contributions to the Bulletin should be sent to the editor, Mr. John Arnold, Department of Adult Education, University of Southampton, Southampton S09 5NH. The Annual General Meeting of the Society will be held on Thursday 25th. October, 1979, at 6 p.m. at the Royal Commonwealth Society, Northumberland Avenue, in the De La Warr Room. Papers will be sent out to members during October. The President of the Society, the Most Reverend Trevor Huddleston CR hopes to be present.